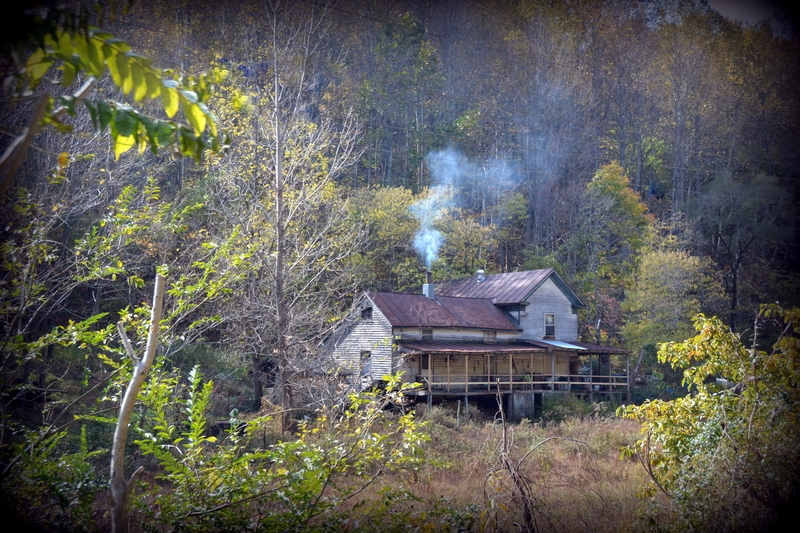 During our trip to the mountains last weekend, we drove by this old ramshackle house. We passed through this same area last year on our annual fall foliage trip. Marshall was with us then, and we both caught a glimpse of the house and noticed that clothes were hanging on a clothesline all along the porch. A few miles later, we stopped at an antique shop. While there, Marshall recognized a print for sale of the old house….. with clothes hanging on the line. He inquired about the print, and was told that local legend has it that if clothes are hanging on the line, there’s moonshine available for sale. No clothes were on the line last weekend; but I couldn’t help but wonder if there’s a hidden meaning to smoke from the chimney? Nah, probably just trying to warm that old house. This entry was posted in Traveling Days and tagged moonshine, old house, smoke from a chimney. Bookmark the permalink. Oh my that looks like a scene from a movie. Let your imagination go as it zooms in on the stories. What a drab looking house but colorful history. Interesting post, Dianna. I’m sure that old house is a challenge to live in, especially in the winter. But it’s SO picturesque! There’s a little creek that runs between it and the highway. Perfect illustration for a Halloween blog. Sorry you and JR could get any moonshine! LOL! Yes, I think folks live there. If you zoom in, there’s lots of “stuff” on the porches. I’d like to know how old the house is! Love that old house. There were lots like that in our neighborhood in WV. The people in them had as much character as their houses! oh, that’s too cool! sneaky! Of course, if everyone in the area knows the “signal”, there’s not much secretive about it, is there?? Well, THAT is something! That old house is sure interesting…in more ways than one. 😉 It’s also just a bit spooky looking, perfect for Halloween. I guess it is a good one for Halloween! What a wonderful old house to capture around this time of year. Your picture is perfect!! I too zoomed in (which I love to do with all your pics) and saw lots of things handing on the outside walls and sitting on the porch, One of your best,Dianna,! Ha! Love this story….so glad Marshall inquired about the print 🙂 I agree with Pam….I bet that smoke meant clothes would be on the the line shortly!